SEISMIC STABILITY IS SOMETHING WE (FINDING OURSELVES IN THE MIDDLE OF A TECTONIC PLATE) DON’T DWELL ON TOO OFTEN. IN SHIFTING GROUND, ZOE SCOGLIO SHINES A TORCH ON THE FISSURES IN THE PLASTER WALLS OF OUR HOMES, AS WELL AS IN OUR RELATIONSHIP WITH THE EARTH. The performance opened bang on one month after a 5.2 magnitude earthquake sent Melbourne shuddering on June 19, sparking ‘online hysteria’ (at least in my Twitter feed). The earth, as Scoglio so magically describes it, is not inert. And to be reminded of that is to look at ourselves, our built structures as well as the earth’s mineral resources as finite. A ceremonial glass of sencha tea awaited us as we piled into Meat Market’s Studio B where we were then asked to pick up a rock from a collection lined up against the wall. A round table stood in the centre of the darkened studio; an air of ritual prevailed. Cross-disciplinary artist, Zoe Scoglio is high priestess, but more often a conduit here; through her exploration of the sonic and physical space the audience makes new and rather philosophical connections. Our chosen rocks sit on the edge of the table, meaningless and static until they are picked up and transformed in her hands. Through gestural choreography they take on the shape of ice floes or moving continents. Crushed quartz is spilled onto the table creating a frozen landscape; the rocks perform a glacial dance, spinning and settling into place. The table is strung with piano wire inside, emitting vibrations as rocks journey across it. A sun-like spotlight joins in. Donning a miner’s torch, Scoglio becomes an explorer finding cracks and marks on the walls of the studio, evidence of the shifting earth below. The geological transformations that we witnessed earlier are not over. 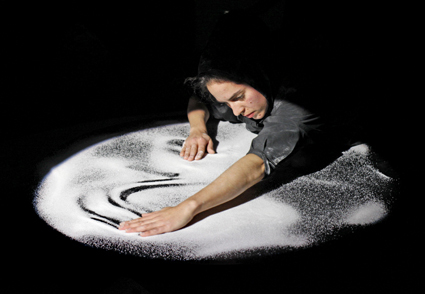 An installation resembling a cave wall becomes the focus, the performer removing a part to get at a rock inside. In a playful way, Scoglio questions how inanimate objects arrive at their place and for what duration of time. In the spirit of William Blake, we see the world in a few grains of quartz and eternity in a 40-minute performance. Later a projection shows a rock spinning on a dark background, a foreboding meteorite; Scoglio’s own face briefly flashes across the wall, echoing her video Rock Bodies (made for Next Wave’s Timelapse program in 2009). In cultures that practice animism, natural forces, plants and animals are not regarded as lower than or separate from human beings. As Scoglio continues her inquiry, it begins to appear that the relationship between humans and earth is as much a spiritual question as any. This is imparted by her almost Gregorian-like chanting, which sets the rigged-up table to shake violently at the end of the performance, causing the quartz crystals to bounce off as if by magic. A machine sets the floorboards vibrating, reminding us again of the recent quake, and like the meteorite, of our own temporal nature. Scoglio’s performance is a finely cut gem, moving with perfect timing across landscapes and ideas.